NASA partner Sierra Nevada Corporation (SNC) of Louisville, Colo., performs a captive-carry test of the Dream Chaser spacecraft Thursday at NASA's Dryden Flight Research Center in Edwards, Calif.
A private space plane took to the skies for the second time ever Thursday (Aug. 22), passing a "captive carry" test that will help pave the way for the new vehicle's free-flying debut this fall. The Dream Chaser space plane, which the Colorado-based company Sierra Nevada Corp. is developing to fly astronauts to and from the International Space Station, was held aloft by an Erickson Air-Crane heavy-lift helicopter in the skies above NASA's Dryden Flight Research Center in Edwards, Calif.
Sierra Nevada Corporation is developing its Dream Chaser spaceplane to ferry astronauts to Earth orbit and to the International Space Station. See how the Dream Chaser space plane works in this infographic. Sierra Nevada Corporation is developing its Dream Chaser space plane to ferry astronauts to Earth orbit and to the International Space Station. The space plane's flight computer and guidance, navigation and control systems were tested during the flight, and its landing gear was deployed as well. The other firms vying to fly NASA astronauts into space are SpaceX, which is working on a manned version of its robotic Dragon capsule, and Boeing, which is developing a capsule called the CST-100. NASA hopes at least one of these three vehicles can be up and running by 2017. "It's great to see real American-made hardware taking flight right here in the U.S.," Ed Mango, NASA's Commercial Crew Program manager, said in a statement. 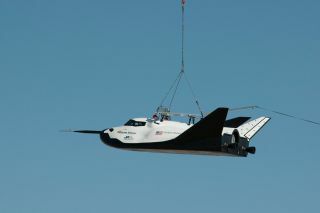 "This is just the start of an exciting flight test campaign for SNC's Dream Chaser at Dryden." Last week, NASA announced that it had added $15 million to Sierra Nevada's latest commercial crew award, to help the company meet two additional Dream Chaser milestones. The new funding brings the value of the award to $227.5 million, Sierra Nevada officials said. Engineers have been putting Dream Chaser through its paces at Dryden in a variety of ways. Earlier this month, for example, the space plane was towed down a runway by a pickup truck at several different speeds to test out its braking and landing systems. Follow Mike Wall on Twitter @michaeldwall and Google+. Follow us @Spacedotcom,Facebook or Google+. Originally published on SPACE.com.